Don't you wish you were here? 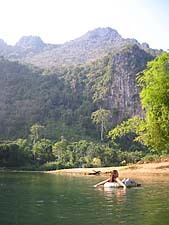 The perfect swimming hole at the top of Kuang Si Falls - how could I resist? 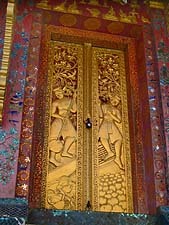 This is the continuation of my southeast Asia travelog, which began in Cambodia. Click here to start at the beginning. We were leaving Siem Reap Friday morning at 8am. As much as we got jostled around on the road coming in, we swore we wouldn't go back over that road on the way out. We intended to fly out. But six days after the fact we both looked back and realized it hadn't really been that bad. I was actually looking forward to seeing it again. And because we cut out our trip to Phnom Penh, we weren't so rushed. We had some time on our hands, so instead of flying straight to Laos, we once again got in a taxi and started over the road to Poipet, and back to Bangkok. We made even better time on the way out, 2 hours and fifty minutes from Siem Reap to Poipet. I was glad we decided to brave the road again. I was a bit shell shocked the first time, so seeing it again in a better state of mind made it easier to appreciate the scenery even more. Not to mention it saved us a ton of money. Once we were back in Bangkok, we had to get tickets for the overnight train to Nong Khai in the northeast. 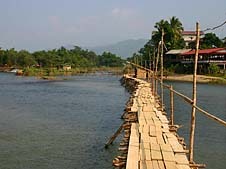 This is a popular place to cross into Laos. 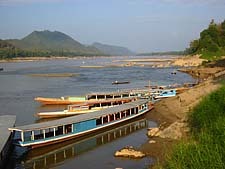 The Mekong River serarates the two countries, and Laos' capital city, Vientiene, is just a few kilometers from the border checkpoint. Geting to the Bang Sue train station, where we would be departing from, was not as easy as I had expected due to some language barrier problems. From looking at my city map, I knew it was almost within walking distance from the bus station we'd just arrived at, but when I said "train station", the taxi driver only wanted to take us to Hualomphong. For years, the only significant train station in Bangkok was Hualomphong, but recently, in order to ease congestion more and more train routes have been reassigned to other stations. Knowing he didn't understand, we got in the taxi anyway, assuming we could make ourselves clear once we were on our way. Bad move. We got on the expressway and had driven about four miles out of the way, when all of a sudden, our driver's eyes lit up. It had just dawned on him where we needed to go. "Ahhh, Bang Sue. You go Bang Sue?" Evidently, I hadn't pronounced Bang Sue with just the right inflection for him to understand. Either that or he was running up the meter. The skeptic in me had already decided. After turning around and coming back almost to where we started, we finally got dropped off at Bang Sue. Ah, urban adventures in Asia. I love it. Looking like typically lost English speaking tourists, we looked around for the ticket window. Amazingly, without knowing a word of written Thai, I managed to find our train, the time of departure and which track it was leaving from. Thankfully, providence was on our side this night. There were only two tickets left in the sleeping compartment. We snatched them up without hesitation. For 414 baht, they're a real bargain. The second class, no air conditioned, overnight train is really the way to go in Thailand. We had a couple of friendly people sharing the cabin with us. After some awkward fumbling with the language, we ended up talking a bit and sharing some drinks with the other passengers, and even the cabin crew. Rather than a long boring trip I expected, it turned out to be a lot of fun. 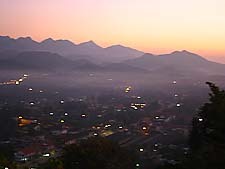 And waking up at sunrise with a chill in the air and seeing the rural Thai countryside was invigorating. 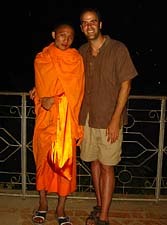 Just a couple of hours after I woke up, we came to the last stop before the Laos border, Nong Khai. To get into Laos from Nong Khai, you have to cross the Friendship bridge over the Mekong River, but there are a few steps involved. From the train station in Nong Khai, you have to take a tuk tuk to a bus station. Then a bus takes you to Thai immigration for your departure stamp. Then you wait for the same bus to take you over the bridge, straight to Laos immigration. At Laos immigration, you have to buy a visa, and they want U.S. dollars. There's even a sign in the window, in large point type, "US$30". Well, since we didn't have dollars, only Thai baht, we got taken a bit on the visa. The exchange rate they used was ridiculously inflated, charging 50 baht to the dollar when it's closer to 39. So, we had to pay 1550 baht instead of $30. No big deal, it happens here. 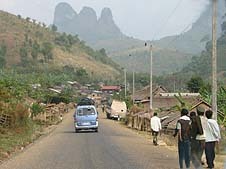 Once we cleared immigration, we decided to continue on to Vang Vieng. We had decided to stop there en route to Luang Prabang since we had read a little bit about it in the Lonely Planet guide and it seemed like a nice little town with lots to see and do. We found a minibus driver who would take us there, 3 hours away, for 250 baht apiece, along with three others we'd met from the train. Not a bad price. We loaded up in the minibus and worked our way through the capital of Vientiene, which was actually a much bigger and busier city than I'd expected. Still most of the roads were dirt and from looking around it was evident just how poor the country is. I had yet to eat anything this morning, so thankfully we stopped for lunch in a small family diner, one I suspected was run by our driver's family. He seemed more than just casually acquainted with them. But the food here was excellent and cheap, so I have no problem with that. I got a little sample plate of several different dishes, which were all laid out buffet style. Total cost, seventy cents. We spent a relaxing time here getting to know the other travelers that we'd met just recently; Greg, who's on his fourth trip to Laos, we met waiting for the train in Bangkok. Faith and Heather, two sort of hippy girls from Northwest Washington, we met coming through immigration. They were traveling around all of southeast Asia at leisure for four months. One of the things I love about traveling places like this is the comeraderie you get with other travelers. It's easy to make conversation and it's fascinating to hear about where all they've been and where they're going. They have the same interest in you. Plus there's a bit of common ground if you've managed to end up in remote corners of southeast Asia after traveling from the U.S. 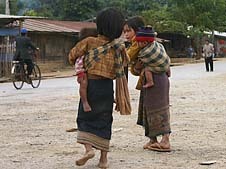 The three hour trip from Vientiene was our first introduction to rural Laos. Right away I could tell it was going to be a contrast from what we'd seen in Cambodia. Although it's probably just as poor as Cambodia, there seemed to be a little more infrastructure and development, at least in the parts we've seen already. 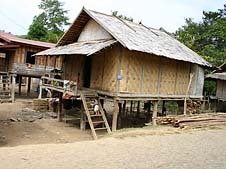 In Cambodia, outside of the city, the structures were made of only bamboo and thatch, sometimes ramshackle wood homes could be found. Here at least, the structures seemed to be sturdier and many were built from concrete. Just as in Cambodia, there was a curious fascination with us, the farang, traveling through these parts. 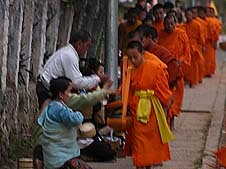 Laos is a nation that's not yet accustomed to foreign visitors. Until just a few years ago, independent travel here was not permitted. 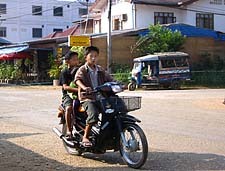 Even the tourists who do come now tend to fly into Luang Prabang and back out in a few days. I was looking forward to taking the more adventurous route. We drove up highway 13, which is somewhat infamous for banditry and guerilla activity, although I saw nothing intimidating about it. It seemed perfectly safe to me, pretty quiet and dull actually. I heard later that there had been a shooting incident in February 2003 in which two Swiss tourists had been shot while riding their bikes and coming upon a robbery in progress. To me, incidents like that seem completely anecdotal and I'm not sure why anyone gets too worried over it. I face more danger walking around in some parts of my hometown than I do here. The first nine tenths of our trip was over flat and mostly straight roads. 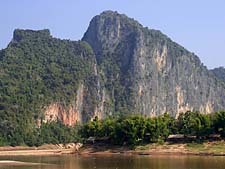 I knew Laos was fairly mountainous in some parts and I was eager to see the mountains. 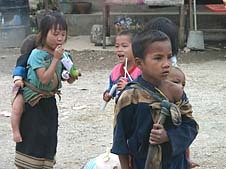 It wasn't until just before we arrived in Vang Vieng that I started seeing them. It made me eager to get out and start exploring. We finally got to Vang Vieng. I was a little confused about where the town actually was. Our driver said we were here, and wanted to know if we had a guesthouse we needed to go to, but all I saw was a big gravel field that looked like an abandoned industrial complex, with the occassional motorcycle or bus driving across. As I came to find out, this was an old air strip, built during the war and long since dormant. 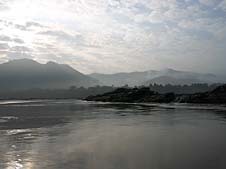 The town sits behind it, along the river. We didn't have a guesthouse in mind, so we went wherever our driver suggested, not always a good idea, but we ended up at the nondescript Pany guesthouse. Hard beds and no real breakfast, but for $3 a night, I've got no real complaints. I liked Vang Vieng right away. It's very small but has a nice, easy-going feel to it and sits in a beautiful valley with an impossibly gorgeous, picturesque sunset every night. One picture I took on our first night here I'm now using as my computer's desktop wallpaper. Speaking of our nights here, when we first arrived, I had intended this to be maybe a one or two night stop just to break up our trip and give us a chance to relax a bit. We decided to stay another night and now yet one more, a total of four. There's just a lot to like about this little town. The scenery is great, you can't help but relax - there's not a lot to do, and the atmosphere here is very laid back. 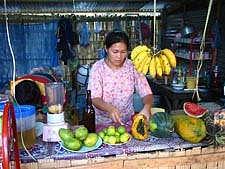 You can buy fruit shakes everywhere, a big bottle of Beer Lao is 80 cents, and a good afternoon can be spent taking a tube down the Na Som river. On our first day here, we arrived in the afternoon. After resting a bit and getting cleaned up, we went to check out the market, which we'd heard was very good here, and to see the river. At the moment I saw the river and the landscape around it, I fell in love with this little town. The setting is indescribable. It's like a small enclave of little-known nirvana, where children are romping with abandon in the river, a blazing orange sunset illuminates the sky, a quaint and rickety bamboo bridge takes us over to a natural terrace overlooking the river. Here we found a couple dozen very contented travelers. More than a few of them had taken advantage of this area's reputation for lax enforcement of laws against recreational drugs. I'm not a drug user and never have been, but being fairly libertarian, it doesn't bother me. I was just enjoying the moment and happy to see others were also. We found a mat to sit on on the terrace, presumably put down by an entrepreneurial lady who runs a fruit shake stand nearby. We watched the sun go down and crossed back into town for dinner. If I wasn't already enamored with Vang Vieng, dinner did it for me. We went to one of the resaurants on the main street through town. The five of us all ate together and just ordered several items intending to share it all. We had curry and rice, mutton stew, spicy Indian dumplings and more. All told, including a large beer, my share of the bill came to $1.80. Here is when it dawned on me that it's never a bad thing to be flexible in your travel plans. When we started out, I was intent on seeing Phnom Penh, but we decided to cut it out altogether. We also cut back the number of days we were planning to spend in Bangkok. Being that I'm more fond of the rural areas anyway, it seemed like those were good decisions, for the chance to add days to a place like this or Luang Prabang. 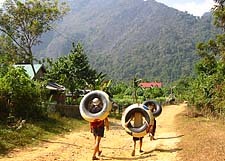 With the peaceful river running right on the edge of town, one of the most popular activities here in Vang Vieng is to go tubing. There are several companies operating to take you down the river, and all of them have exactly the same price and exactly the same service, which is nothing more than giving you a tube and driving you about four kilometers up the road to an inlet where you can start your journey. For this, we were charged 25,000 kip each. Not a lot of money when you think about it, but after becoming accustomed to the super cheap prices for everything so far in Laos, my eyes bugged out. That's outrageously expensive. That's almost what a night at our guesthouse costs. Nevertheless, it's a fun trip. So much fun that I had to do it two days in a row. I keep saying it, but I really can't say it enough, the sense of relaxation here just permeates everything. A tubing trip down the river just typifies that sense. You jump in and the river takes you at its pace. You can't rush it along or dictate your pace. But then, when you're here, among towering limestone cliffs, happy children playing and spearfishing, oxen grazing on the riverbanks, the cool water splashing on you and the sun tanning you, why would you want to rush this anyway? This is the most relaxed I've been in a long time. A small part of the appeal of tubing down the river is just seeing who else is there, meeting other tourists and seeing the locals go about their daily lives, almost oblivious to us. In one strange coincidence, I met a young woman from England and chatted with her for a time as we were floating down the river. I don't remember how the topic came up, but I guess we were talking about what brought us to Laos and where we were in life when the subject of age came up. She asked me to guess her age. After correctly narrowing in on the year, 1971, I told her I was also born in 1971, May 13th to be exact. At that, her jaw dropped, "You're kidding! That's my birthday too." As this conversation ran its course, we came to find out we were born not only the same day, but almost exactly the same time, she in England and I in the U.S., taking into account the time zone difference. There was a difference of about 12 minutes. I don't know why that's so interesting to me, but I find it really strange and amazingly coincidental that here I am floating down a river in Laos and meet someone who's come all the way from England and just by happenstance, we were born at almost exactly the same time. Weird. 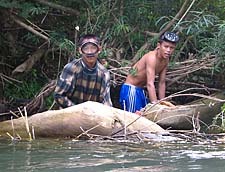 Another interesting encounter I had on this trip down the river was with a group of boys, about eight of them, who were lined up in a dugout boat. They were looking for people to race them down the river. Of course, with most people in tubes with no paddles, and eight of them with paddles, it wasn't much of a competition. And the boys seemed to enjoy the imbalance of power. They did get a bit of a challenge from one guy in a racing kayak, although they still beat him. At one point, myself and Christine, the girl from England who shared my birthday, stopped to chat as best we could with the boys. Some of them knew limited English. They were a fun-loving bunch of kids, and I got a big chuckle when they saw we had beers and Christine had cigarettes. Their eyes lit up, grabbing for the cigarettes. Another was excitedly saying, "Ah, ah, Beerlao, Beerlao." Beerlao is the national beer and just about the only kind you can get here. It's nearly ubiquitous here and everyone knows "Beerlao" (all one word). In fact, just saying Beerlao here is an easy way to strike up a conversation and connect with the locals. You often get a knowing smile and handshake. 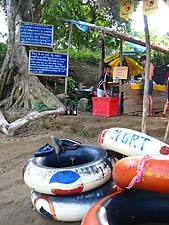 About halfway through the journey down the river, there is a family run pit stop where you can pull off the river (they'll throw you a rope if you need help), come ashore and hang out for a while. They've built a small shelter and serve sandwiches, cold beer, and fruit shakes. I think their choice of location had a lot to do with their other business, cave tours. The entrance to one of the more interesting caves sets just behind this pit stop, conveniently. For a whopping 5000 kip (50 cents) you can rent equipment and get a guided tour through the caves. And I felt it was well worth it. Not only is the cave truly fascinating, but the guides really know it well and take you to places in the cave that have interesting features, or a story behind them. If that wasn't reason enough, there's the altruistic reason. After being here for a few days and seeing just how desperately poor the people of this country are, I have a real desire to spend money here and help put my tourist dollars in their hands. And on that subject, I have to say one of my biggest pet peeves about traveling here is running into other western tourists who seem to make a sport out of seeing how hard they can bargain with the locals. This is pointless and aggravating. If you have a job that pays just above minimum wage in the U.S., it takes you ten minutes or less to earn one dollar. 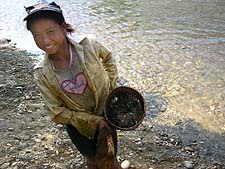 In Laos, the majority of people work a full day of hard labor to earn one dollar. I don't understand what motivates some tourists to try to pay as little as possible to the people here, whether it's for the fun of it, their perspective has gotten distorted, or if they truly feel justified somehow as if they need that money more than the Laotions do. Whatever the reason, it aggravates me. If anything, I wish I could give these people more. They're hard working, friendly people who have a terrible lot in life and not a lot of opportunity. Being from the U.S. and only knowing a comfortable existence all our lives, it's sometimes hard to remember that most of the world doesn't have it nearly as easy. If you ever happen to visit Laos, please don't be one of those tourists. If someone at the market asks you for 5000 kip, don't insist on 3000. The difference is twenty cents. That's so little as to be insignificant to most westerners. To a Laotion, that's a fifth of a day's income. Try being just a little benevolent. 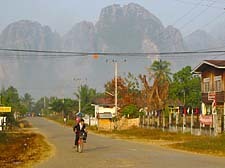 Before I came here, I heard Vang Vieng sometimes described as a hippy enclave. While I guess there is a little bit of that crowd, it's by no means exclusive to hippies. I came here almost expecting to see Woodstock Asia. In reality, that's not the case. There is that element here, of course, but it's not as dominant as I had expected. I think the catalyst to drawing hippy types here may have been the opening of an organic farm community just north of town, right at the river inlet where we started tubing. 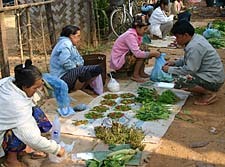 The Phoudindaeng Organic Farm was started about eight years ago and has been a major success. It has provided food for the locals and tourists, and an opportunity for civic minded tourists to volunteer. The business has slowly developed over the years. 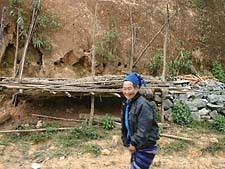 It's now common to see a couple dozen westerners at the farm volunteering for anywhere from a week to several months. They have also opened a small restaurant on the main street in town, serving the food grown at the farm, including a sweet and delicious mulberry wine. If you have any interest in volunteering in Asia, this could be a good opportunity. I know they welcome any help. We left Vang Vieng on Wednesday, reluctantly. That was a place that I had really grown a fondness for, to my surprise. It was a nice find, for a place we had no intention of even stopping at in the first place. But on Wednesday morning, John and I, along with Faith and Heather, the two girls we'd met crossing into Laos that we'd been hanging around with since, loaded up on a 10 seat mini-bus and made our way to Luang Prabang over a road that curved uphill or downhill for all five hours of the trip, there was never a single stretch that was flat or straight. 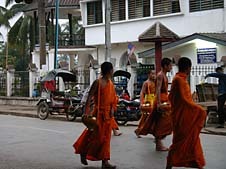 We spent three nights and two days in Luang Prabang. It's a picturesque little town with more wats and temples per square mile than probably any other town in Asia. 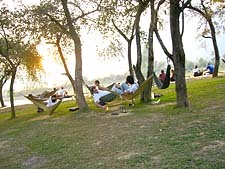 It sets nicely on the Mekong river and has a very carefree walkway along the river. We came here without any room reservations, nor knowing much about what might be available. 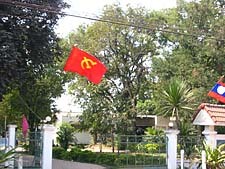 On the recommendation of someone we'd met in Siem Reap, we tried to find the Mekong Guesthouse. After walking up and down the road by the river a few times, not exactly sure where it was, we finally found it. 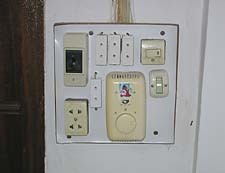 We asked to see a room (always a good idea in southeast Asia) and weren't really thrilled with what we saw. A boxy room with dingy walls, a bare bulb for light, thin walls that did nothing for sound dampening, and a very hard bed. But, by this time, late in the afternoon, accommodations weren't abundant, so we decided to take the room and look for something else tomorrow. We were pretty well worn out and wanted to just get settled for a little while. The lady who ran the guesthouse could see that we weren't thrilled with it and kept trying to explain, "Tomalow be moe", which I at first mistakenly thought she was speaking Lao. I tried explaining to her that I didn't speak any Lao. She shook her head and said more slowly, "Tomalow be moe." After another three rounds of this, I realized she was explaining, as best she could in English, that tomorrow there would be more rooms available. We should have been gracious enough to wait and find out, but we didn't. We went out in the morning looking for something a little nicer. After looking at a few places, we came across the Viradessa guesthouse. This was a bit cleaner, certainly had more comfortable beds, and was cheap, only $5 a night. The only downside was the jackhammer racket going on outside. They were rebuilding the road right outside our room. But being that they were only building between 8am and 6pm, that was inconsequential. We took it. Two features dominate the town, first is Wat Xiang Thong, which sets at the top of a grand staircase that descends all the way down to the river. 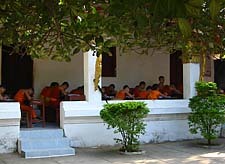 The wat is an expansive array of small temples and monasteries. 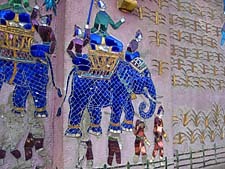 Most of the walls are decorated in intricate gold carvings or brightly colored mosaics. Then, at the highest point of the town, Mt. Phousi, sits a gleaming white monastery. Most visitors to the town seem orient themselves by looking for this monastery. Main street in Luang Prabang turns into one giant market at night. Dozens, if not hundreds, of vendors turn out, unfolding the mats and quilts that mark their spot, and put their wares on display. This stretches on for about five or six city blocks. Even if you're not much of a shopper, like me, you can't help but be tempted to take advantage of the cheap prices. Do I really need a set of 20 onyx and silver chopsticks? Of course not, but for $4, why not? 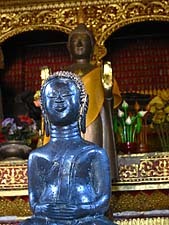 Most have roughly the same goods for sale; wood carvings, chopsticks, clothes, incense burners, etc. There is the occasional vendor, however, that offers something truly unique, usually something they have hand crafted themselves rather than bought for resale. 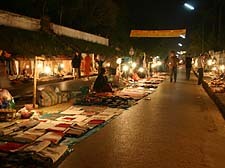 We came across one lady who was selling an intricately embroidered tapestry, probably six feet long by three feet wide. She said it had taken her 45 days to make it. She was asking about fifty dollars for it, which means she would probably end up selling it for forty dollars or less, after the usual bargaining that's expected in Asian markets. I almost felt sorry for her, knowing how many days she put into making it, and then to only make so little from it. In the U.S. people would probably pay $500 in a boutique store for something similar. Another young man, probably about twenty, was an artist, selling his unique and highly stylized paintings. Some were on clay tiles, but others, oddly, were painted on hollowed out eggs. At first I thought this was a really strange canvas, but the more I looked at them, the more capitvating they became. I was really intrigued. He had a consistency to his work, using deep ruby red and gold colors mostly, but painted beautifully blended and highly detailed depictions of life in Laos. There was no way I could leave without buying one. This young man probably makes a very good living if he sells any number of these. At $5, this was the most expensive item I had purchased in the street market. The food stalls at the street market are also very tempting. Like most of Asia, the main staple food here is rice. But there's also an abundance of chicken and pork, along with plenty of fresh vegetables. Most of the food at these stalls was purchased the same morning at the markets. There is no such thing as a grocery store here, so unless you're a farmer, you rely on the street markets for food. It may be a surprise to some visitors, but the food at the markets is usually very fresh and delicious. One of the things I've come to like the most about Asia is how cheap and plentiful the food is. And the people here who prepare it are excellent cooks. It's easy to overindulge here. To be sure, food stalls on the street aren't for everyone, especially if you have a weak stomach. But if you have a sense of culinary adventure, it can be a lot of fun. The food stalls here are not only functional, but they're also pretty festive. Whole families come out at night and socialize here. I wandered from table to table looking, probably rudely, at what everyone was eating. From one stall to the next, there was an endless variety of colorful, hearty looking soups, meat of all kinds roasting on skewers over open fire pits, and all kinds of batter fried dumplings and spring rolls filled with who knows what. There's something very electric about the atmosphere. As I walked through the loud, crowded, narrow and dim dirt alleys where vendors had set up shop, I had a palpable sense that I stuck out like a sore thumb, but I also felt very welcome. I have no doubt that the people there were as inquisitive about me as I was about them. Luang Prabang is a sleepy little town. It's not difficult to enjoy a day here just wandering up and down the main street, popping in and out of the boutique stores and restaurants, stopping for coffee and pastries at one of the bakeries, or admiring the fine wood and silver crafts on display in many stores. I came to really enjoy breakfast here. Sitting outdoors at a bakery, watching traffic come and go on the river while the air was still crisp, enjoying Lao coffee (some of the best in the world). I truly felt as content as I had in a long time. Two features of Luang Prabang are prominent on the tourist circuit here, the Pak Ou caves just north of town, where Buddhists have built shrines inside caves alongside the Mekong River, and Kuang Si falls, a sprawling assemblage of a dozen or more waterfalls, big and small. We ended up touring these two sites, not only because we wanted to, but because as you walk along the riverbank, you face a barrage of touts offering the trips. Since we were looking to go see them anyway, we picked a trustworthy looking guy and asked him about it. He spoke surprisingly good English and offered to take the two of us tomorrow, to both the caves and the falls, for $25. That was about the going rate, so I didn't haggle any. We agreed upon a time and told him we'd see him at 7am the next morning. Before we left him though, he was sure to inform us, with a lowered voice and a sly wink, that if we wished he could supply us with some opium. Well, thanks but no thanks. As agreed, we met him back in the same place along the river at 7am. 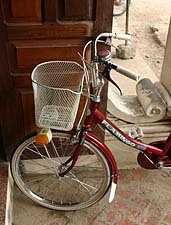 Although we thought he would be taking us, he was in a hurry to rush off, he was a high school student, late for class. It was actually his dad, who spoke no English, who would be taking us. It was an amuzing twist, but didn't cause any problems. The son had explained where we wanted to go, what to do, and the price we'd agreed upon. So, at that, we started off upstream. I have to say I was a bit disappointed with the caves. It was interesting, but not all that enthralling. It was certainly a nicely done shrine and showed a lot of devotion on the part of loyal Buddhists. 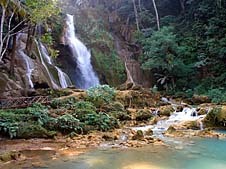 But all in all, if I had to do it over again, I would have preferred to go just to the Kuang Si falls. Part of my ambivalence about it may have been just how long it took to get there. 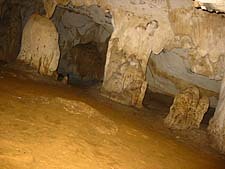 The caves sit about 20 kilometers north of town. We really had no idea how long it takes to go 20km up river by boat. Now I know...it takes a long time. We were probably cruising for about two hours before we got there. John and I were both thinking the same thing when we arrived, that we're never going to have time to go back to town, then another 30km south to the Kuang Si falls, then back up river 30km, all in one day. We would have spent another seven hours just traversing the river, and it was already about noon. Maybe the boat driver expected we'd be out there until midnight, but we had hoped to be back in town not too long after sundown. 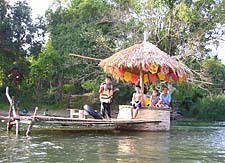 So, on the way back down the river, we had the driver pull over at the boat ramp in Luang Prabang. We lied and told him that John was getting sick and had to get off. At that he offered him a little opium to calm his stomach. I just had to laugh. Does everyone in Laos think westerners come here to smoke dope? Or maybe they do and I'm the one that's ill-informed. Who knows. Back at the caves when we were mulling this over, John and I decided we'd just take a tuk tuk down to the caves. It would be much faster, and probably not much more expensive. And as it turned out, the boat driver agreed to take $15 instead of the $25 we'd agreed on for a full day, and the tuk tuk wanted $10 to take us to the falls and back. So it came out exactly even. Once we arrived at the falls, it only confirmed what I had been feeling already, that we should have just come and spent a full day here. At the first sight of one of the falls, and the powder blue pool below it, my skin tingled. It was literally like something from a Disney movie. It was the most beautiful natural landscape I'd ever seen. And this was just the first one we came across. As we kept moving through the trails, we discovered several more spots like this. I just couldn't get over how pure, how blue, how unmolested it all looked. It's one of the most pristine nature settings I think I'll ever see. After coming across several of these small pools, we finally came to the end of the trails, where the dense woods opened up and revealed the real gem of this park, a gigantic set of falls with numerous little cascades, all towering about five hundred feet high. Yes, there was a trial to the top, and yes, we had to go up. Man, was it a hike. I had trained at the gym for about three months to prepare for this trip, knowing how physically demanding it would be, but when I got to the top, I was exhausted. But of course, it was so worth it. It was very serene at the top, and quiet. Including the two of us, there were only five people at the top during the whole time we were there. And almost as if it had been placed there artificially, there was one perfect swimming hole just below the top of the falls, with a horseshoe ring of water spilling into it. On top of that, there was a perfectly placed vine right at the edge, calling out to me, just waiting for me to grab ahold and do my best Tarzan swing right into the water. I could have spent days there. It was a blast. I've not had that much fun since I was a kid.